Prof. 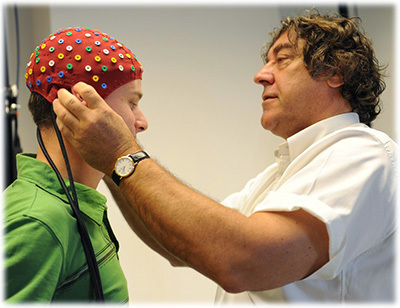 Guy CHERON (1) in UMons SE and (2) in the LNMB, applying an EEG cap. His research units currently have expertise in the field of EEG, evoked potentials and movement analysis. The LNMB has developed expertise in the field of multiple EEG and evoked potentials by working with the cosmonauts (ESA, NASA & JAXA), the Gagarin Cosmonaut Training Center in Star City (Moscow) and the Johnson Space Center (NASA, Houston). 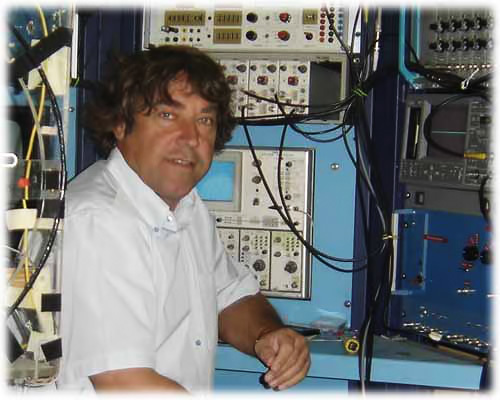 As Prof. G. Cheron is also Director of Electrophysiology at the University of Mons, the two groups work together in the field of brain oscillations. Cooperation with the College de France (Prof. A. Berthoz) allows us to establish links between the psychophysical performance of astronauts and brain oscillations. The LNMB equipment offers the possibility to simultaneously record the EEG activities, ERP, EMG and 3D movement in a real environment. NihonKohden systems and multi-ANT 128-channel EEG dynamics are used in parallel with the VICON system (12 cameras operating at 200 Hz) and synchronized to the 16-channel wireless EMG system and a eye-tracker. The virtual reality simulator tested in recent space missions is also used. The LNMB is currently involved in space mission NeuroSpat (Increment 19-20-21). The aim is to study perception, attention, memory, decision and action (PAMDA) during sensorimotor tasks. The LNMB was also involved in a european FP7 project (ICT-2009.7.2) : Mindwalker. The aim of this project was to design a support system in locomotor handicapped so they can realize their daily activities. New approaches based on brain-computer interfaces (BCI) are being tested. The BCI approach is conducted as part of our DRNN technology associated with virtual reality. Download here Guy Chéron's CV.